It soon became all too clear as the night turned to day that there was little appetite among the Turkish people for another coup. Indeed, rather than any popular support for the rebellious soldiers, the people took to the streets to show their anger at what was taking place supposedly in the name of freedom, democracy and secularism – the fine sentiments used by the coup leaders in the short statement issued that to justify their extraordinary if short lived action. The ruling AKP’s attempt right away to lay the blame on the Gulen movement for instigating the coup seems highly implausibly given that Fethullah Gulen is a manifestation of political Islam and as such not a supporter of the secularist ideals expressed by the coup leaders. The Gulen movement, led by a wealthy exiled cleric, has become the knee-jerk bogeyman in Turkish politics and is immediately blamed for anything that goes wrong in the country since Gulen’s public fall out with Erdogan over corruption scandals a few years ago. 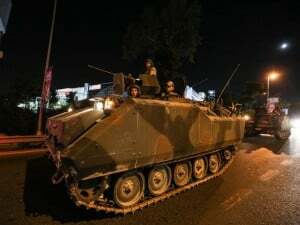 The 15 July coup failed because the Turkish people were simply unconvinced that they would benefit in any way from yet another period of military rule and given the record of coups in the country’s history that is entirely unsurprising. As soon as events began unfolding, the pro-Kurdish HDP quickly issued a strong statement condemning the coup and calling for the immediate restoration of democratic politics. The only certain method to remove a political leadership is by democratic means backed up by mass involvement of the people. A coup, no matter how well planned, is unlikely to succeed for very long unless it can command popular support however tyrannical the government it is seeking to remove might be. The aftermath and repercussions of this failed coup in Turkey pose tremendous dangers for the people, not least in the drift into far more authoritarian rule. It is inevitable that Erdogan will use the coup to his own advantage and he allegedly called it a “gift from Allah”. There are already calls for a return to the death penalty. Reports of Erdogan supporters beheading soldiers in public and film of screaming crowds stamping on the bodies of soldiers who were trying to surrender expose the atavistic sentiments for revenge that the coup seems to have unleashed as a backlash. The ugly scenes are all too clearly reminiscent of the cruelties carried out by ISIS terrorists. These are dark times for Turkey and the wave of revenge is likely to have consequences outside the borders of the country in neighbouring Syria and beyond. The Islamist terrorists whom Ankara has long been accused of supporting have just been given a huge confidence boost. The opposition to Erdogan and the AKP are likely to come under increased pressure and will face more fierce attacks from a government whose confidence is strengthened by its success in defeating the attempt to oust it. The prosecutions of people in the media and political activists are likely to continue without a break. As of the Saturday afternoon following the failed coup, state prosecutors had issued arrest warrants for 140 Constitutional Court members and 48 members of the Council of State for alleged participation in the plot to unseat Erdogan. There is little likelihood that the moves to prosecute the HDP MPs, already under way following the lifting of their parliamentary immunity, will be slowed down. The measures might even be escalated. Exercising restraint will be viewed as a weakness and Erdogan will not want to show any more signs that he is not in full control. On the contrary, he will want to demonstrate unequivocally that he is in the driving seat. And of course, magnanimity was never one of the character traits for which the autocratic president is famed. There must be real fears that the war against Kurdish communities will be taken to a new more brutal level with early reports suggesting that military actions in the southeast are being stepped up. Within this new far more dangerous context for Turkey and the potential spill overs on its neighbours, support for a democratic, inclusive, secular Turkey is now more urgent than ever and an end to the Kurdish conflict will remain a central challenge to the nation and its political leaders. Throughout his political ascendancy Erdogan has shown that he totally lacks the vision to heal the wounds festering in Turkish society. The prospects that he will use the current crisis to centralise more powers into his own hands are alarming. A triumphant Erdogan seeking “revenge” should fill everyone who believes in democratic norms and the rule of law with a feeling of intense foreboding. Finally, are coups always such a bad thing? Just a couple of days ago, until it was savagely interrupted by the massacre in Nice, France was celebrating a coup that still defines the character of its country and its people; that is, the storming of the Bastille. The French Revolution started out as a kind of coup. Many historians also regard the Russian Revolution of 1917 as a coup; but it was one that brought down the hated Czarist tyranny that was never to return. Looking further back in history, to the England of the 1640s, Oliver Cromwell led a successful coup against the tyranny of Charles I and his “divine right” to rule; that popular resistance headed by Cromwell’s New Model Army during the English civil wars forged Britain’s modern parliamentary democracy and many people today regularly continue to salute Cromwell’s statue which stands outside Parliament in all its glory. So coups of themselves are not necessarily the worst option and indeed coups that fail can bring about far worse consequences than those coups that succeed. It remains to be seen whether Turkey’s tyrannical President Erdogan will be strengthened or weakened in the long term following the recent failed coup in that country. David Morgan is a supporter of Peace in Kurdistan campaign.